← I’m Ready, Are You? This is a story my dad told many times. It’s a true story and he’s Glen. Glen’s first job in a hotel kitchen was as a cook’s helper. 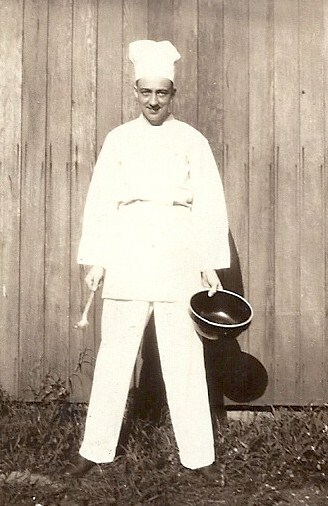 He bought a white cap, white apron, neckerchief and seersucker pants. It was a large hotel, where they served lots of private parties. Jack was the head chef and he was tough! A dinner was scheduled for one of the most prominent families in the city. It was a dinner celebrating the 80th birthday of the former editor of the city newspaper. Everything had to be perfect. A roast pig was the main entrée on the menu. Glen was scheduled to be helper of the cook who was in charge of roasting the pig. It was the first time either one of them had roasted a pig. The pig was delivered to the hotel kitchen. He had been butchered, but the head and feet were still on him. But he was too long, even kitty-cornered to fit in the roasting pan! The cook said to Glen, “Hey, let’s do something a little different! What if we set him up on his haunches’? I think Jack would like that!” They’d do anything to please Jack, just so they could keep their jobs! So the pig was set up in the roasting pan. Some blocks of wood were set up under his chest to hold him up. Another block of wood was in his mouth, so they could put an apple in later. They cocked his head just as they wanted it, but his ears looked out of character, hanging down like pigs ears do! So they took skewers and stuck them down into his ears and pinned them up so his ears were sticking straight up. He was the most alert looking pig! He looked like the dog in the Victor advertising, listening to his master’s voice! They, very carefully, shoved the pan, with the pig sitting up, into the oven. The cook told Glen, “It’s your job to use a ladle and baste the pig every half hour. “We have to do a good job with this pig, or we could lose our jobs!” So, every thirty minutes Glen pulled the pan out and basted the pig. He enjoyed it and the pig was looking good! It took most of the day to roast the pig. When Jack got there, he was so angry he couldn’t talk! He just stared at that poor burnt pig! Well, over in the bake shop was an old man, Bill, who had been a chef, in his day, but now he was old and worked in the bake shop. But he was an artist! He did the ice sculpturing, decorating of the cakes and so on. They had been to him before when they needed help fixing something up. Jack was actually jealous of him, but now he ordered us to fetch Old Bill. Someone ran to the bakeshop and told Bill to come quickly! Bill calmly told them to take the pig into his bakery. He covered a large oval shaped plank with white, fluffy mashed potatoes. They, very carefully, set the pig up, on his haunches, in the middle of it. He, then, filled a large pastry bag, with mashed potatoes, like one used to decorate a cake with icing! The first thing he did was work on his ears. He pulled the skewers out and threw them away. Then he cut out some ears from heavy brown wrapping paper, put them in place, and covered those ears with mashed potatoes! Then he worked on the face to make it look attractive. He put cranberries in the eye sockets! He put the apple in his mouth! The pig was looking good! But what was Bill going to do with that hole in his back? They soon found out! He took his big pastry bag filled with mashed potatoes and made the most beautiful saddle right over that big hole! Oh, he was the most beautiful roast pig they’d ever seen! In fact, it was the most beautiful piece of culinary art they’d ever seen! Glen and the other three men, carefully carried the pig into the dining room. Old Bill followed along behind, with his pastry bag, ready to fix up any part they messed up. The party was ushered in. They had been to lots of parties and thought they’d seen everything! But they were in for a big surprise! When they came in and saw that pig sitting right up on his haunches, beautiful saddle on his back, beautiful ears standing straight up, apple in his mouth, they were amazed! “Oh, Father,” one of the daughter’s exclaimed, “Look what they did for your birthday!” The old man came over and shook his head. He never dreamed they would do anything like that for him! It was soon time to carve the pig. Jack had put on a clean apron and cap, found his sharpest carving knife, and was ready to carve the pig. He was smiling from ear to ear! He carved away but stayed away from the saddle on his back! When it was all over, he was given a big tip! In those days, money was scarce but they thought he deserved a big tip! He kept it, too!!! He didn’t even share it with Old Bill! This is a true story and happened in about 1929. My dad was trying to work his way through college. Then came the big financial crash! That ended his college career. He was fortunate to keep working in various hotels in the kitchen and eventually became a chef! A very good chef! Years later, after a life-changing experience with God, Glen, my dad, became a minister and this story became a favorite among his listeners, especially young people. It was a perfect illustration for how God can take a ruined life and make a masterpiece out of it! God can and does! This entry was posted in Dad, Glen Williamson, Heavenly Father, Iowa, Me, Memories, Roast Pig, Story and tagged Dad, Free Methodist Church, Glen Williamson, Iowa, Me, Memories, Roast Pig, Story. Bookmark the permalink. A rollicking tall tale, and it’s true you say. Bring ’em on, Anita! Thanks for reading and commenting, Marian! It’s one of my favorite stories of my dad’s.